Young Abraham, right, and his fictional acquaintance Utz take a monotheistic journey in a new CGI animated direct-to-market release. 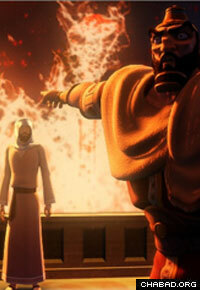 One of the most ancient tales from the Torah has been illuminated in the newest style of CGI animation to form a three-dimensional world where characters and cities exist in an animated platform on the computer. It’s the combination of old text with modern animation that’s turning heads. “Young Abraham: From the Ancient Stories of the Israelites” is a high quality cutting edge animated film that relates the story of Abraham and his quest to prove that G‑d is not made of stone and can be discovered through the conscious mind. In less than an hour, the film spans the first 75 years of the Jewish patriarch’s life, revealing a little-known biographical tidbit that is not found within the Torah itself, but rather comes from compilations of Midrashic lore. Yisroel Bernath and Zvi Hershcovich, two Chabad-Lubavitch rabbis living in Montreal who also happen to be screenwriters, close friends and study partners, began extensive research to set up the plot of the movie based on a timeline, characters and tales of Abraham’s life from ancient rabbinic sources. Abraham lived in a world where the prevailing belief system was predicated on various forms of idol worship. He was the first to recognize the monotheistic nature of G‑d, and broke many sculptures and mindsets along the way. Taking place in the ancient region of Mesopotamia, the film begins with King Nimrod commanding his general, Terach, to give up his newborn son Abraham, because stargazers foretold that the boy would one day rebel against the king. The film follows Abraham’s childhood years spent hiding in a cave and traces the path he followed to become a great leader. Among the more touching scenes is when Abraham experiences his epiphany that will ultimately change the course of the world: When he leaves the cave and meets Utz – a fictional character based on a name found in the Torah – Abraham questions how a stone image could possess supernatural powers if he could break it. When Abraham meditates on nature and realizes that the sun and moon must have something greater than them – a Creator of all life – he puts a piece of cloth on his head. He moves to Canaan to study with Noah. While there, he experiences a revelation: Since G‑d had become so angered with the world that he tried to destroy it through the Flood, his job was to fix the world’s imperfections and make it a better place. That meant leaving Canaan and returning to his birthplace, facing Nimrod, and abolishing idolatry. The tales of King Nimrod, like the rest of “Young Abraham,” were taken from Midrashic literature and classical rabbinic commentaries. Bernath says a tremendous amount of detail went into creating the finished story and the Mesopotamian city of Ur. Based on the minimal archaeology available from that period along with what’s described in the Midrashic literature, the team painted a picture of what they believed the city looked like. The project took four years and a huge – and diverse – team of innovators: From devout Chasidic executive producers and screenwriters to at least 25 animators, artists, a secular Jewish director and a non-Jewish producer. J. Jacob Potashnik helped polish the script and Haim Sherrf, a Lubavitch artist from Montreal, drew the initial characters that were later used by the animation team. Bernath was involved along the way in character development and scene production to ensure the story and experience remained consistent with classical sources. Convincing the non-Jewish director, Todd Shaffer, to stay true to the Jewish commentaries was not always an easy task, but the team settled on a compromise: They peppered the script with such older English words as “wrath,” “upon” and “avenge” to appeal to non-Jewish audiences. Already the DVD is selling fast in Jewish stores since its pre-market release to coincide with the holiday of Purim. Prior to this project, Bernath had been involved in small-budget films, voiceovers and screenwriting for Jewish educational films. Hershcovich, who ran Chabad-Lubavitch of Stavropol in Russia, is now a full-time screenwriter working on some Hollywood scripts. Bernath had to convince fans that this was kosher entertainment and stemmed from the same texts they were studying in yeshiva. Really Amazing! The film is really amazing. We enjoyed it thoroughly. This is way above and beyond everything that is out there. Thanks Chabad.org for this article.